The extra large black MILWAUKEE M12 Heated AXIS jacket kits are designed to protect from cold and weather on the jobsite. Powered by M12 REDLITHIUM Battery Technology, these heated jacket kits use carbon fiber heating elements to create and distribute heat to the chest, back and shoulders. A single touch LED controller heats up the battery heated jacket to three heat settings, creating a comfortable heat for any environment. This MILWAUKEE heated jacket kit has a new Quick-Heat funtion that creates and distributes heat three times faster than our previous jackets and market competitors. Hybrid AXIS Ripstop Polyester provides a lightweight, compressible design that can be used as an outer shell or a mid-layer jacket and provides wind and water. This kit comes with one heated jacket, an M12 battery and charger. The DEWALT DCHJ060C1 X-Large Heated Jacket can provide hours of core body warmth and continuous heat. This jacket features 4 Core heating zones; upper left and right chest, mid-back and collar. The entire line of DEWALT 12-Volt MAX and 20-Volt MAX batteries can be used with this jacket. A DEWALT 1 Year Limited Warranty is included for added peace of mind. Includes DCB201 20-Volt MAX Lithium-Ion Battery (1.5Ah), Fast Charger and DCB091 USB Power Source. 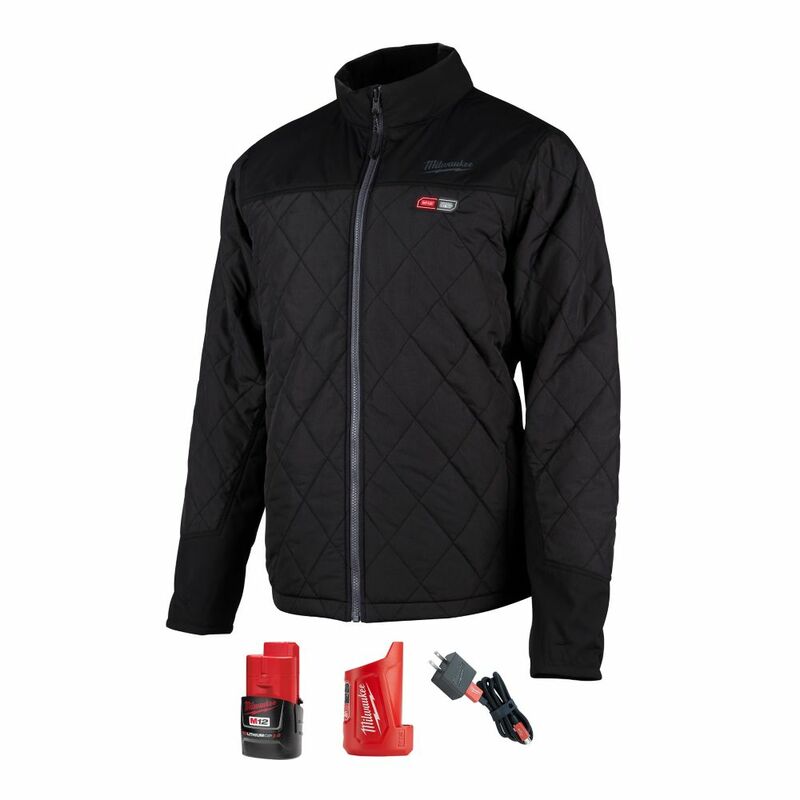 Men's X-Large M12 12-Volt Lithium-Ion Cordless AXIS Black Heated Quilted Jacket w/ (1) 2.0Ah Battery The extra large black MILWAUKEE M12 Heated AXIS jacket kits are designed to protect from cold and weather on the jobsite. Powered by M12 REDLITHIUM Battery Technology, these heated jacket kits use carbon fiber heating elements to create and distribute heat to the chest, back and shoulders. A single touch LED controller heats up the battery heated jacket to three heat settings, creating a comfortable heat for any environment. This MILWAUKEE heated jacket kit has a new Quick-Heat funtion that creates and distributes heat three times faster than our previous jackets and market competitors. Hybrid AXIS Ripstop Polyester provides a lightweight, compressible design that can be used as an outer shell or a mid-layer jacket and provides wind and water. This kit comes with one heated jacket, an M12 battery and charger. Men's X-Large M12 12-Volt Lithium-Ion Cordless AXIS Black Heated Quilted Jacket w/ (1) 2.0Ah Battery is rated 4.3 out of 5 by 42. Rated 5 out of 5 by Steve from I followed Milwaukee’s fitting guide and it fits as expected.... I followed Milwaukee’s fitting guide and it fits as expected. It actually has room for layering although with the heating coils it works better with layering over the jacket. Rated 5 out of 5 by Matthew from Great jacket! Really gets warm!... Great jacket! Really gets warm! Rated 4 out of 5 by Nick from Well built jacket. Warm even not turned on. I... Well built jacket. Warm even not turned on. I bought a 3ah compact battery. Much better run time. Heats up fast. Rated 4 out of 5 by Kevin from Battery location is not in the best spot in my opinion. Would like the option to move it to a f... Battery location is not in the best spot in my opinion. Would like the option to move it to a front pocket while driving. I have had it for a month now and wear it daily. Overall the jacket is warm and well made. Rated 5 out of 5 by Steve from Great product, hacker keeps you warm. Get it tight. Great product, hacker keeps you warm. Get it tight. Rated 4 out of 5 by Mike from Fit is great, the works great under my heavy coat for those brutally cold days. Fit is great, the works great under my heavy coat for those brutally cold days.